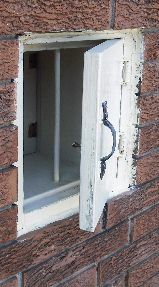 Once upon a time, every self-respecting home was built with a milk chute which was usually located next to the side door. The chute would be accessible from the landing of the basement stairs. Even though they were called milk chutes they were also used to deliver other products such as eggs, bread and vegetables/fruits. 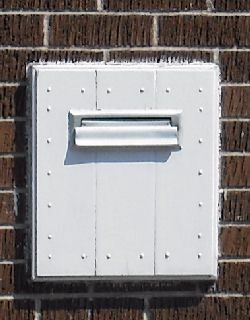 Although home delivery of milk and other perishable products began to disappear in the late 1960s and early 1970s a large number of these relics can still be found in older neighbourhoods. The chute had an exterior and interior door. The milkman would come and use the exterior door to take out the empty bottles and put in the fresh milk and the door on the inside would be used to take it out. If the homeowner needed something extra or different from the usual order, they would leave a note in the neck of one of the returning empty bottles. The milk chute was also, on occasion, used for something else and I quote one of my clients: "Whenever we'd get locked out of the house, one of us kids would squirm our way in through the milk chute and unlock the door. Seems there was always one of us small enough to get through." During my 25+ years as a building inspector I have seen many uses for the old milk chute. Here are just a few samples: * Converted to mailbox. * Shoe storage. * Storage for household items. * Storage for tools. * And believe it or not, as a pet door. 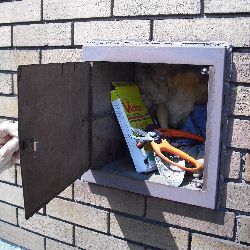 The outside door of the chute would be left open so the cat could jump in and bump open the inside door. 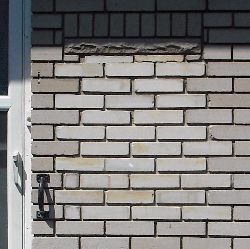 Would you open the front door 2" (50 mm) and leave it that way all winter? I guess not, nobody would. And still I have seen hundreds of old milk chutes that are not used, are not insulated and are not sealed. The average size of a milk chute is 12"x16" 30x 40 cm) that is 192 sq. in (1200 sq cm) which equals the heat loss from having to front door ajar all winter. The milk chute should be removed or retrofitted, see below. 40-50 Years ago a small kid could get through the milk chute and open the outside door. Today kids can do the same. I recall a newspaper story from a few years back that reported a burglar paid a small boy $5.00 to go through the chute and open the door! * Remove the chute and fill in the opening with glass block windows. The glass blocks will give you security and more light for the basement entrance area. 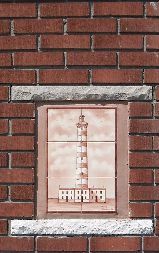 If it is impossible to use standard sized blocks you can have them custom made, which could be expensive. * Three step chute retrofit. 1-Open outside door, line chute with a 6 mill vapour barrier and fill chute with fiberglass batt insulation. 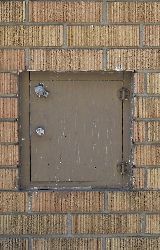 3- Use screws to secure door.